Conquer battle royale the Battlefield way. Firestorm is Battlefield™ V’s 64-player battle royale experience, fought across land, sea, and air on the largest Battlefield map ever – all while a raging inferno slowly destroys the playing field. Play in a four-person squad or fight the fire solo. You’ll trade bullets using Battlefield V’s expert gunplay, flush out foes with bona fide destruction, and dominate the field with some of World War 2’s most formidable vehicles*. Firestorm launches March 25 as an update to all Battlefield V players, and sets the spark for Chapter 3: Trial by Fire. Below is a quick rundown so you won’t get smoked. 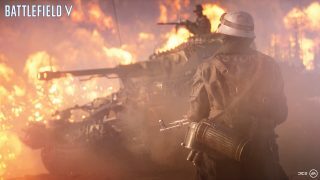 Battlefield Core Gameplay: Firestorm comes with Battlefield V’s core gunplay and destruction intact. But expect surprising changes that’ll shake-up battle royale as you know it. 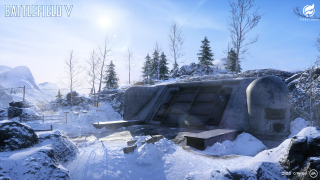 Halvøy: This snow-covered peninsula draws the best soldiers into combat on the biggest Battlefield map ever. Objectives: Play as a squad to secure Re-supply Points and Vehicle Lockups that are strewn across the map for a chance at wielding vehicles and gear from Firestorm’s most valuable stockpiles. Combat Vehicles: Command an armory of devastating vehicles over land, air, and sea – including five new vehicles for Firestorm. If you want the power, you’ll have to take the risk and challenge other squads to be the first to unlock the best combat vehicles from Objectives. Reinforcements: Part of Firestorm’s rare loot, call down Reinforcements like the V-1 Rocket, artillery strikes, and combat vehicles to wreak havoc on the battlefield. On the flipside, order supply drops to aid your squad in an instant. Destruction: Firestorm brings true Battlefield destruction to the battle royale genre, making for unparalleled moments and unique tactical opportunities. No more camping in buildings when a V-1 rocket can blow your house in. Roll four-person deep and face the Firestorm with allies or go at it solo. Whether playing with friends or strangers, teamwork against the persistent ring of fire is the difference between singed hairs and a boiling death. The top way to erase enemy squads is to move, scavenge, and fight as a team. There are no second chances in Firestorm, if you bleed out or are finished off by an enemy, you’re out for good. Rely on your squad for revives, resupplies, equipment trades, and locking down Objectives (see below). You’ll be able to enter Firestorm with any soldier from your Company. Although none of the class perks or Combat Roles are available in Firestorm, the visual customizations from your Company do carry over. After a quick stop in the player lobby, you’ll be flown above the map and will have seconds to decide what section of the map you and your squad should land on. While freefalling, landmarks, supply points, and the Firestorm itself will appear on the map. The location of your squad mates is also visible on the mini-map and each squad member has a unique color so that you can better tell who’s where. No one knows when the first burning structure was reported on Halvøy. There were orders to evacuate, but now the only way to escape is to be the last squad standing. 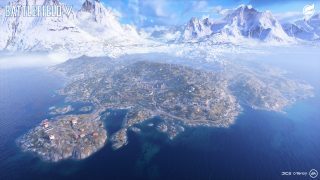 Halvøy is 10 times the size of Hamada – currently the largest Battlefield V map. The map is characterized by 12 landmarks that function as desirable loot locations. With so much real estate, the map favors the dirt, but fighting in the surrounding ocean or the sky above carries tactical advantages. Study our Halvøy map for more ways to prepare for the brewing storm. The only zone hotter than the one you’re landing on is in the encroaching ring of fire. This is a disaster no soldier can train for. The tsunami of heat will incinerate everything – buildings, soldiers, and the ground they walk on – so you should stay away. The Firestorm appears from the moment of deployment and shrinks the playable space on the map over time. This will push all soldiers toward a central location, forcing survivors to an inevitable showdown. Once you land, prepare for a fight and go find some loot! Start on Halvøy empty-handed and become more powerful as you scavenge and defeat enemies. Soldiers in Firestorm have a modified inventory that can carry a combination of weapons, ammo, and gadgets. All resource collecting happens on the battlefield itself. Space is limited, so manage your inventory wisely and share loot amongst your squad. Scattered loot — Weapons and ammo can be found grounded all over the Halvøy terrain. Defeated enemies — You can loot the inventory of a fallen foe for whatever goods they may have. Firestorm has five distinct types of Objectives designed to reward those who play together. However, some of these high-value rewards come at the highest risk and require a coordinated team effort to secure. Strongboxes – These contain a variety of supplies including weapons, gadgets, and healing items (see below). They are scattered throughout Halvøy and more common near landmarks. Safes – Secure safes are located inside Halvøy ’s landmarks and contain high-value loot. Unlocking the loot inside takes about 20 seconds, so try and have a squad mate watch your back. Supply Drops – Random supply drops will occur throughout a Firestorm match, delivered from a plane above and marked by a green flare once hitting the ground. These contain rare and powerful loot, so rest assured you won't be the only ones after them. Re-supply Points – As the Firestorm closes in, supply points at various points of the map may become active and can be located by the rising barrage balloons. If you or your team can hold one of these points, you will be rewarded with rare and epic weapons as well as Reinforcements. Vehicle Lockup – Abandoned combat vehicles and other valuable supplies can be found locked behind bunkers in strategic locations. These sites can be accessed by having two players interact with a mechanism on either side of the doors. Warning! Alarms will sound while you are opening a bunker, alerting everyone in the vicinity. See our dispatch for a full take of how to play each Objective. A subset of Battlefield V weapons are available in Firestorm. They are categorized by weapon type and require their corresponding ammo: rifle, shotgun, MMG, sniper, and SMG. Weapons are also found in three different rarity levels — Common, Rare, and Epic — with a degree of advantages. Soldiers get two primary weapon slots as well as one sidearm. Battlefield V’s gadgets like the Bouncing Betty and Sticky Grenade make their way to Firestorm, but there are also a few additions unique to the battle royale experience. Soldiers start with four gadget slots in their inventory, one for healing items, one for grenades, and the last two for whatever they find in their inventory. Backpacks can add up to six inventory slots to hold extra gear. All soldiers are also equipped with an upgradeable Armor Vest that can be refilled with up to three Armor Plates, depending on the tier you find in the wild. These protect against some weapon and explosive damage. Pour over the catalogue of Firestorm weapons and gadgets in our helpful breakdown. You don’t always have to outrun the firestorm on foot or rely on bullets to wipe out your foes. Pile into one of the 17 types of vehicles found on Halvøy , including tanks, helicopters, sports cars, and the coveted tractor. 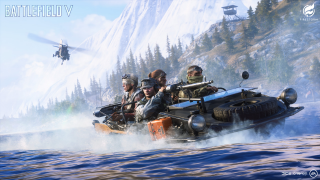 There are five Firestorm-specific vehicles and the existing Battlefield V vehicles have been slightly tweaked for the battle royale experience. In Firestorm, all vehicles require fuel and start with only a limited supply. This also goes with the ammo available for the towable weapons. Luckily, these can be replenished with a Jerry Can for vehicles and heavy vehicle ammo for towables. Check out our detailed look at the Firestorm vehicles. If the flames or soldiers don’t get you, then the Reinforcements just might. A flare gun can be found and used by any soldier to call-in powerful Reinforcements. These include a calculated artillery strike or precision V-1 rocket. Reinforcements can also back up your team in the form of a supply drop loaded with powerful loot, like a fully upgraded Bren Gun, as well as special vehicles. Want more on Firestorm Reinforcements? Read our guide.